(MILLBURN, NJ—4/5/2019)—StarCom Racing, a new NASCAR Cup Series Team, hits the Big Apple debuting its brand at the New York International Auto Show (NYIAS) from April 19-28 at the Jacob Javits Center on 11th Ave. between 34th & 40th St. The StarCom Racing display will showcase the 2019 SCR 00 Chevy Camaro ZL1 with a custom NASCAR paint scheme designed specifically for the NYIAS. SCR’s Booth will be open during the duration of the NYIAS from April 19-28. Show hours are Monday-Saturday 10AM-10PM and on Sundays from 10AM–7PM. More information can be found at www.autoshowny.com. 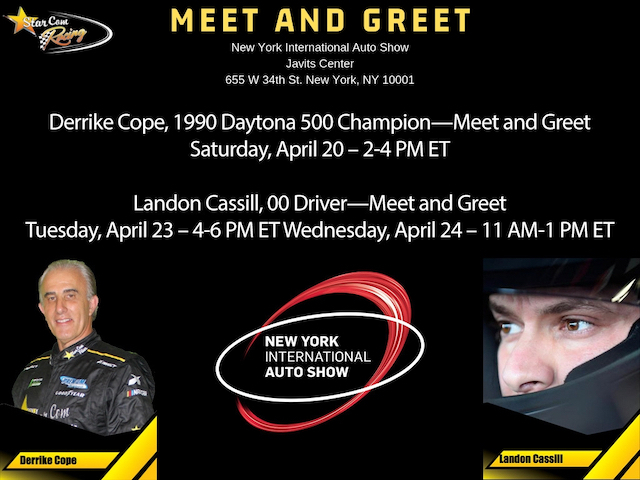 Stop by our booth to learn more about our race team and how you can partner with us or become a VIP Fan at the track for a weekend. There will be giveaways within the booth as well as opportunities for photos and to purchase SCR gear.